The company LAGAR DE QUIRÓS S.L. 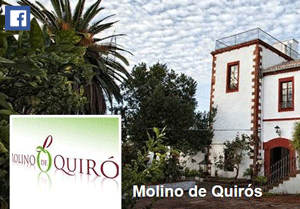 was founded on 4th April 2002 as a family enterprise, with the aim of installing an olive oil factory for transforming the olives gathered on a 120-hectare property owned by the Sebastián Merino family in the town of Montoro (Córdoba), containing over 25,000 olive trees of the Picual (Nevadillo Blanco) and Arbequina varieties. The property's olive production has been classified as "Integrated Production Agriculture (API)" and the oil factory is certified by Quality Standards ISO 9001 and ISO 14001, and is authorised and certified for the production of Integrated Production Oil . It has also gained the "Certified Quality" brand for Integrated Production Oil, awarded by the Council of Andalusia. The company was recently included in the project for the development of the Protected Designation of Origin of Montoro-Adamuz olive oil. The factory is located on a 35,000m2 estate alongside National Highway 420 (between Montoro and Ciudad Real) at exit 52, and has 3 olive press lines with a daily processing capacity of 300,000 kg and 500,000 kg of oil in storage.